Product #2844 | SKU XP-DV-VBG | 0.0 (no ratings yet) Thanks for your rating! Power you camera from Anton Bauer or Sony V-lock style batteries, connects to the DTAP connector of your battery or power plate. 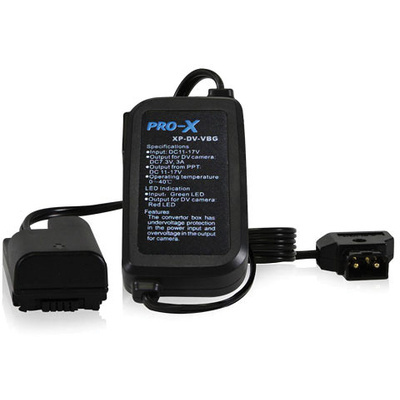 Powered by one Pro-X brick battery, this adapter is able to provide both 7.3V and 14.8V outputs, ideal for supplying power to digital camera and camera light simultaneously, and extremely extending the shooting time. Adapt to Panasonic AG-HMC151 AG-HMC153 and AG-HMC73 professional camera.